Few of the gravestones of Green-Wood’s most famous permanent residents describe their accomplishments. But that has changed, at least for three of our pioneers. 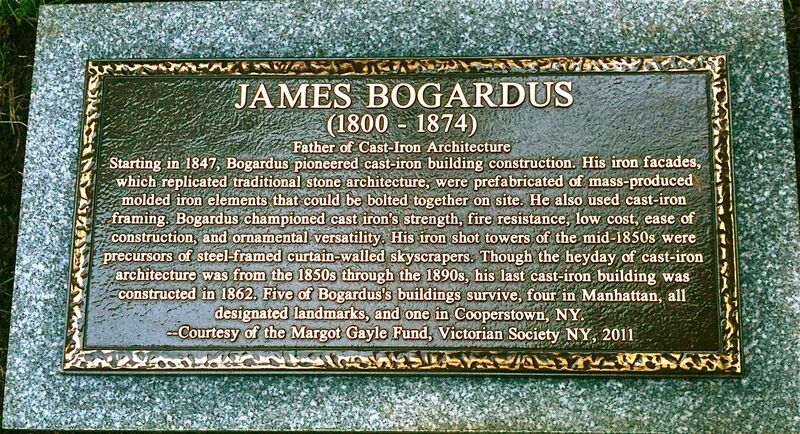 James Bogardus (1800-1874) is “The Father of Cast-Iron Architecture. Daniel Badger (1806-1884), with his Architectural Iron Works firm, pioneered the construction of cast-iron buildings. 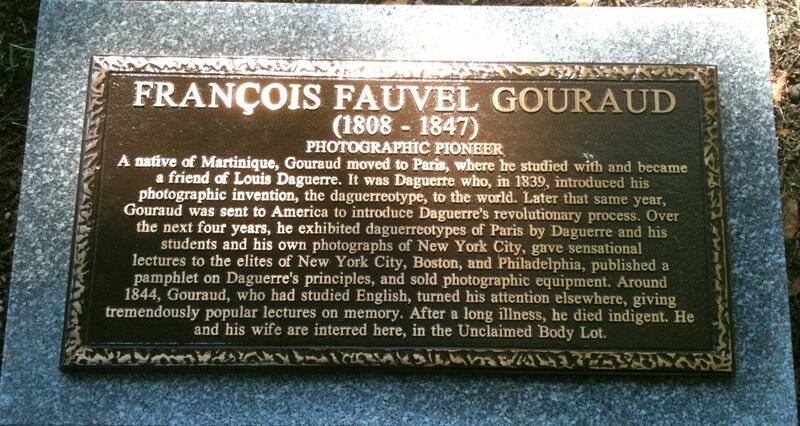 And Francois Gouraud (1808-1847) was sent by Louis Daguerre to introduce his invention, the Daguerreotype photograph, to America in 1839. Bogardus and Badger long have had monuments at Green-Wood, but Gouraud has lain in the Unclaimed Body Lot in an unmarked grave. This carved portrait of Bogardus appears on the front of his obelisk. However, not until weeks ago were their respective accomplishments detailed at their gravesites. With funding from the Margot Gayle Fund of the Victorian Society of New York (thanks! ), Bogardus and Badger now have handsome bronze plaques, mounted on granite bases, that describe their great contributions. 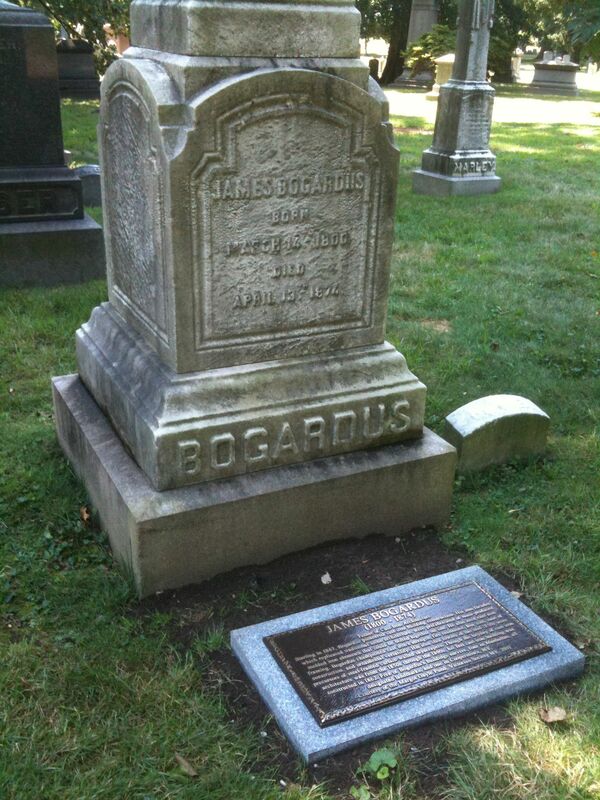 James Bogardus lies in section 161, lot 13438, just off Cypress Avenue, at the intersection of Elder and Petunia Paths. 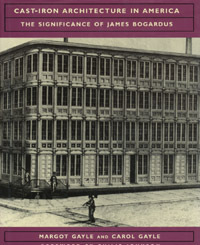 Margot and Carol Gayle wrote the definitive book about James Bogardus. Margot, who died a few years ago, would be happy to know that her foundation has paid for the plaque at Green-Wood that honors Bogardus. The inscription for James Bogardus, on his marble obelisk, says nothing of his accomplishments. 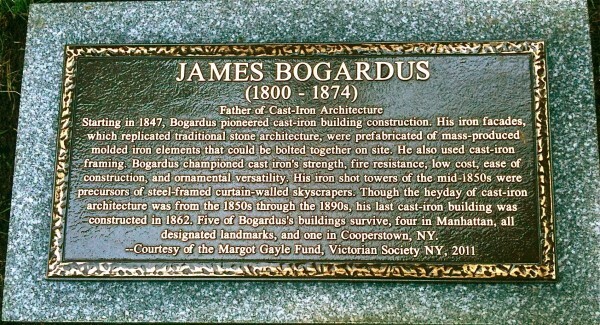 The bronze plaque honoring James Bogardus, "The Father of Cast-Iron Architecture." The simple granite stone in the foreground, carved "Daniel." 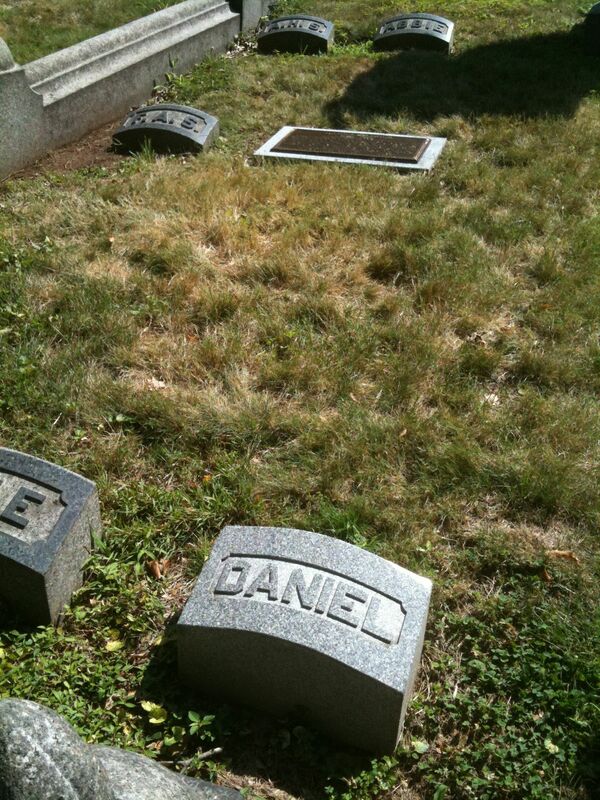 is all that memorialized Daniel Badger until the plaque at the top of this photograph was placed at his grave. 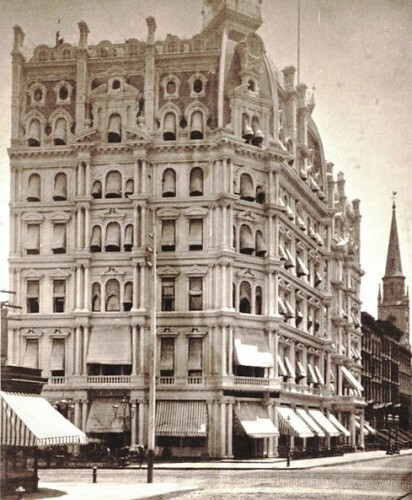 Badger's Architectural Iron Works built the Gilsey House at the corner of East 29th Street and Broadway in Manhattan from 1869 through 1871. This half-stereoscopic view was taken in the 1870s. Gilsey House was built for Peter Gilsey, whose tomb at Green-Wood is just down the road, on Atlantic Avenue, about 50 feet from where Badger lies. This building still stands. Badger lies in section 103, lot 18873, in his family’s lot. It is surrounded by a granite curb. He is on Atlantic Avenue, just down the street from the Beard Bear. UPDATE: You can find Badger’s Architectural Iron Works catalogue here. 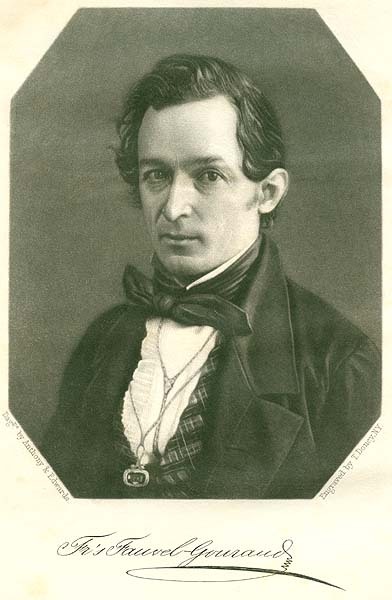 It has some wonderful illustrations of his work. 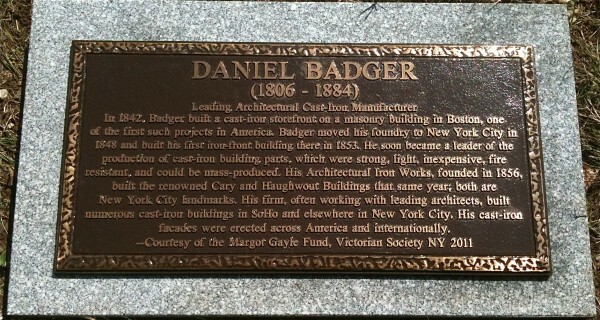 This plaque will alert passersby to Daniel Badger's contribution to cast-iron architecture. And Gouraud’s grave, with funding provided by an anonymous historian, is now marked with bronze and granite. Gouraud is interred behind the Executive Offices, just past the Community Mausoleum along Magnolia Avenue in section 87, lot 4108. His new bronze plaque is just off the road, on the left hand side, before Magnolia Avenue turns towards Valley Water. Francois Gouraud, who was sent to introduce photography to America. Gouraud lay in an unmarked grave in the Unclaimed Body Lot until just a few weeks ago, when this plaque was placed at his grave. Daniel Badger, Francois Gouraud, James Bogardus. ← Good Night Irene . . .